First thing needed is to marinade the chicken in the Thai style ingredients. 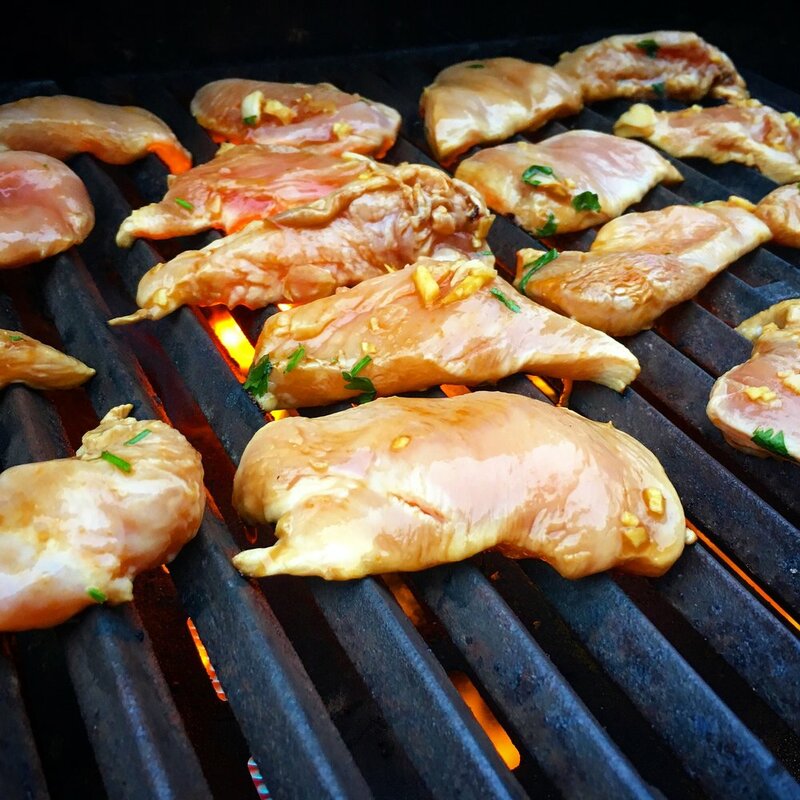 To do this cut each chicken breast into quarters and place in a dish. Squeeze the juice of two limes along with the soy sauce, fish sauce, chopped garlic, ginger, finely sliced shallots and the palm sugar then mix well. Place in the fridge for as long as possible to let the flavours develop and penetrate the chicken. Ensure it is mixed well though so the Palm sugar fully dissolves. I cooked the chicken on the BBQ so crank it up to full temperature and remove the chicken from the fridge around 20 minutes before you place on the grill. This allows a bit of time for the meat to reach room temperature to ensure even cooking. 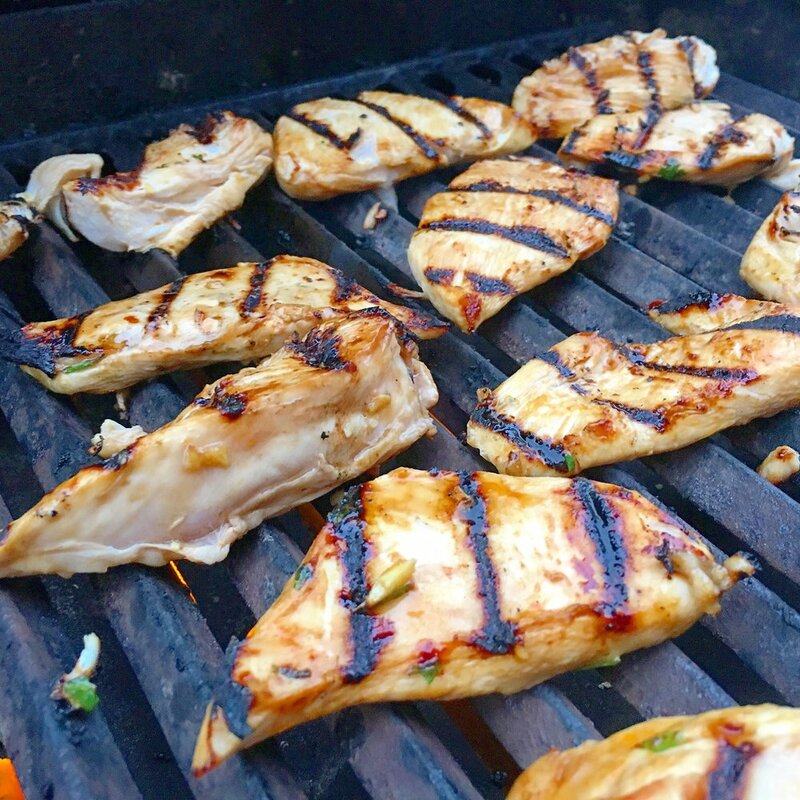 If you cut the chicken horizontally then in half vertically you should be left with 4 fairly thin strips per breast which should only take 3 minutes per side to cook at high temp. Obviously the thicker ends off the breast will take slightly longer than the tail ends. When the chicken is cooked through with no pink colouring, but still moist, remove from the grill and set aside while preparing the wraps. You are looking to buy the largest iceberg lettuce possible as the small versions won't fold over and you will be needing a knife and fork! The additional ingredients for garnishing really make the dish come alive and it only takes 2 minutes to prepare. Finely slice the Jalapeño, spring onion and coriander then crush a bag of cashews. I have talked about how to make the lime and garlic mayo in a previous post, just click here. The last step is to put it all together. To prepare the lettuce remove the bottom half about 2 inches above the stalk and the layers should easily come away without any damage. Finely chop the cooked chicken and place in the lettuce. Dress the wraps with the chilli, coriander, spring onion and crushed cashews and drizzle with the lime and garlic mayo. Use as little or as many condiments as you desire but remember you want the ingredients to remain inside! Fold the lettuce over to make a filled wrap and dig in!